Nine million people na im die around di world for 2015 because of pollution, according to report by Lancet, one of di world oldest medical journal. According to di report, Somalia and Bangladesh na im get di worst case - pollution na when di air dey too dirty, because of smoke from cars, rubbish from factories dem, and other things. Chad, Niger, South Sudan, Madagascar and Eritrea also dey di list. Di experts say di pollution matter dey happen pass for countries wey no too get money - 92% of all di deaths dey happen for poor countries. Dem add say dis air pollution dey kill pass, and most of di deaths na from heart disease, stroke and lung cancer. Na up to 6.5 million people die because of air pollution from gas and from wetin people dey use cook, like fire wood, and charcoal for inside house. Di other type of pollution wey kill people well-well too na water pollution; na 1.8 million people die because of am. Then na 800,000 people also die for around di world because of pollution for di place where dem dey work. Di researchers talk say na poor people dey suffer from all di pollution palava pass, including poor people wey dey stay inside rich countries. 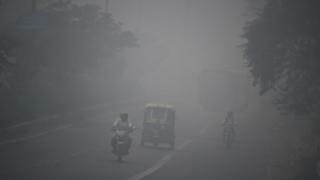 Brunei and Sweden dey among countries wey pollution no dey too kill people.